In football, players huddle to decide which play they are going to run next. Huddles allow the players to communicate, to make sure everyone is on the same page. Running a no-huddle offence can save time, but there's more of a risk of mistakes. ​The same is true for doctors. 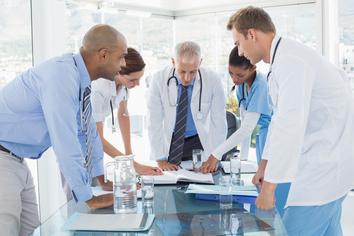 Many cancer centers have special team huddles. These are meetings where experts gather to discuss specific patient cases. These meetings are attended by representatives from most of the cancer-related medical specialties. Attendees often include surgeons, medical oncologists (doctors who prescribe systemic therapies), radiation oncologists (doctors who prescribe radiation), radiologists (doctors who read imaging scans), and pathologists (doctors who look at biopsies and surgical specimens under the microscope). They may also include nurses, pharmacists, dietitians, speech and swallowing experts, audiologists, and other health professionals. Because there are so many disciplines involved, the meetings are often called multidisciplinary team meetings, or MDT meetings for short. In some places, they are called tumor boards or case conferences. Since doctors often specialize in treating only a few types of cancers, these meetings are designed around specific cancer types. The MDT meeting where breast cancer cases are discussed will be separate from the one where lung cancers are discussed, and separate again from the one where prostate cancers are discussed. This ensures that each MDT meeting is attended by experts who specialize in that particular area. In many centers, the meetings are held once a week. Patient cases are reviewed in detail to allow the group to provide opinions. A case discussion will start with a brief presentation of the patient’s history and physical findings. In some cases, when there is a crucial physical finding to be seen, the patient may even attend to be examined by the group in person. ​Next comes a review of all the imaging by the radiologist, and a review of the biopsy or surgical specimens by the pathologist. This review by the radiologist and pathologist is extremely useful - they can provide a second opinion based on the specific questions presented by the group. Based on the information presented, the group then discusses treatment options and makes recommendations. Do MDT discussions make a difference? MDT discussions can have a major impact on clinical care. In early 2016, an Australian group reviewed all the published studies looking at the impact of MDTs. Most of those studies showed that more than 10% of patients discussed at MDT meetings have a change in management plans based on the MDT recommendations. In some studies, the number was much higher. Sometimes changes in treatment occur because MDTs can catch things that are missed, including missing scans. In one example for rectal cancer, the percent of patients having the correct staging tests rose from 63% to 96% if the patient was discussed at MDT. Correct staging can lead to different recommendations. Even if the correct scans have been done, MDTs can lead to a different interpretation of the scans, because a second look is being taken, often by a different radiologist. The same holds true for pathology specimens - they are often being seen by a second pathologist. These changes can then lead to different treatment recommendations. Finally, treatment recommendations can also change because more doctors are available to provide input. ​Basically, an MDT is a roomful of second opinions, all provided at once. MDT meetings occur at many cancer centers around the world, but practices do vary. At some centers, all patients are discussed. At other centers, it might only be a minority or none at all. For most patients, it makes sense to ask your doctor to discuss your case at a multidisciplinary tumor board.